Valtteri Bottas kept up his hopes of ending the year on a high after setting the fastest lap in practice for Formula One's season-ending Abu Dhabi Grand Prix on Friday. 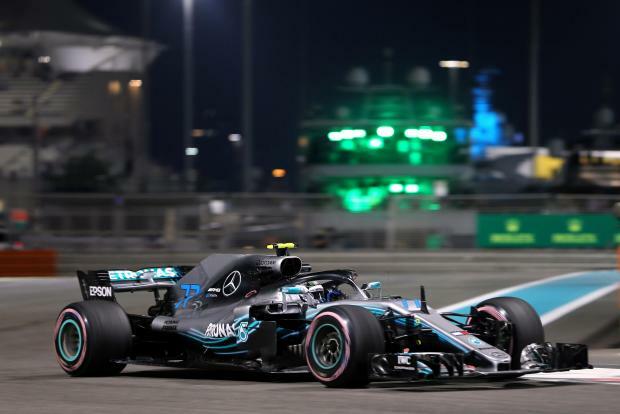 The Mercedes driver, still winless in 2018 while team mate Lewis Hamilton has taken 10 victories and clinched a fifth title with two races to spare, lapped the floodlit Yas Marina circuit with a best time of one minute 37.236 seconds. Bottas won last year's finale from pole position and also set the fastest lap. Red Bull's Max Verstappen, fastest in the first session with a lap of 1:38.491, was second fastest in the evening and 0.044 slower than the Finn. The 21-year-old Dutch driver damaged his car on a kerb, requiring repairs. Australian Daniel Ricciardo, in his last race with Red Bull before leaving for Renault, was second and third respectively in the sessions. Verstappen, at the centre of attention in Brazil two weeks ago after a collision with Force India back-marker Esteban Ocon led to a post-race confrontation, can on Saturday become the sport's youngest driver to take pole position. Hamilton was fourth in both sessions. The Briton replaced his usual number 44 with a one on his car for the first stint. The Briton won in Brazil despite concerns his car's engine was about to fail. Ocon was fifth fastest in the afternoon, in what looks likely to be his last race for a while with Canadian Lance Stroll set to take his place. Ferrari's Kimi Raikkonen, preparing for his last race with the team before joining Sauber, and season's runner-up Sebastian Vettel were seventh and eighth in session one and then fifth and sixth. McLaren's double world champion Fernando Alonso had a special livery on his car, matching his helmet colours, for his last race before leaving Formula One. Poland's Robert Kubica, announced on Thursday as a 2019 Williams driver, was also on track testing car developments and without chasing a quick time in first practice. Sauber's Marcus Ericsson, also moving on after Sunday's race, spun at turn one and hit the barriers in the afternoon.